NOTE: This recipe is one that you may want to serve for a very special occasion, but then what is more special than your own family. 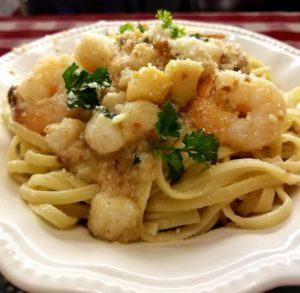 Linguine bathed in rich garlic butter sauce with the little bay scallops and shrimp scampi is nothing less than spectacular. You will love this! Prepare scallops by rinsing in cool water and placing them in drainer. If the scallops have a crescent-shaped muscle to the side of the scallop, cut or pull off and discard. Melt butter and place the butter in a large bowl; add the drained scallops and toss to coat; set aside. Make the breading by combining the bread crumbs, cheese, garlic, parsley and paprika. Place the bread crumb mixture in a large shallow plate. Add the buttered scallops to the bread crumbs and toss to coat. Pour olive oil and 2 tablespoons butter into a large skillet, and add a few of the scallops a little at a time so not to crowd scallops. Sauté the scallops only 3 to 4 minutes, turning once. Add a little more olive oil if needed for frying scallops. Remove the scallops to a large pasta bowl; set aside. In same skillet, add the 4 tablespoons remaining butter. Add the garlic and the shrimp. Sauté the garlic and shrimp for only 2 to 3 minutes, or until the shrimp turns pink. Add the parsley and red pepper flakes and stir together. 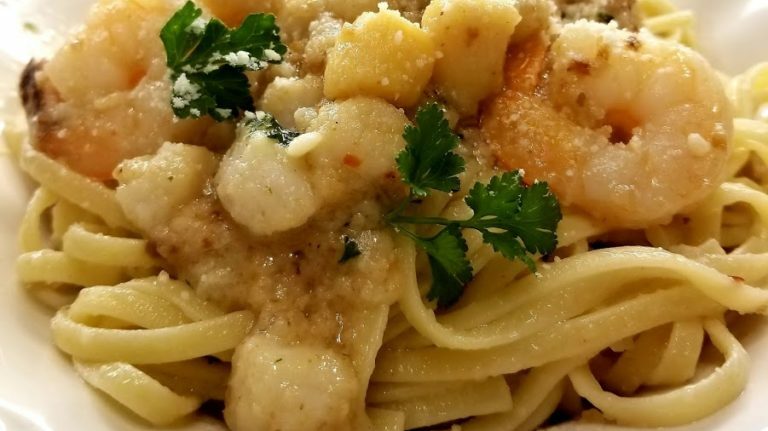 Add the shrimp and garlic to the pasta bowl with the scallops; gently toss together. Boil linguine in an 8-quart pot boiling water with salt added. Cook linguine for about 7 to 8 minutes, or until al dente. Lift linguine right out of the boiling water with a spaghetti spoon and place in large pasta bowl. Add 1 cup reserved pasta water. Add the scallops, shrimp and sauce to the pasta, and coat well. Add additional butte or more of the pasta water if more sauce is desired. Garnish linguine with grated Parmesan cheese and chopped parsley. Serves 6.